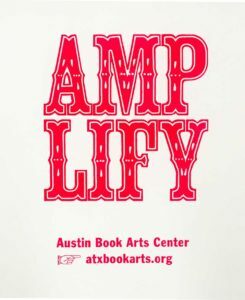 Austin Book Arts Center: Amplify 24 hours & $5000, Can We Raise it? 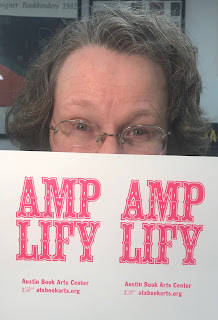 The Austin Book Arts Center (ABAC) is part of an on-line citywide fundraising campaign tomorrow: Amplify Austin. Between 6 pm, March1st, and 6pm, March 2nd, we hope to raise at least $5000. 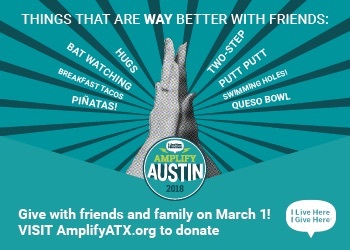 Please consider a donation. Wish us luck and spread the word if you like. Our studio building is in the process of being sold. We have to find a new space before Feb. 2019. We are very thankful to have shared space with 11 other studios and galleries in the Flatbed building. If you are considering opening a book arts center, look for great partners. When ABAC moves we hope to continue in partnership with at least some of our Flatbed Studio and Gallery neighbors. We also hope to add at least one more classroom devoted to papermaking and paper decoration. For the paper marbling class this weekend, we will be covering every surface in the bookbinding studio with plastic sheeting, and at least part of the class will be outdoors. ABAC is currently 736 square feet. One room is devoted to printing with 3 Vandercook cylinder presses, 1 Chandler and Price platen press, several type cases… We have a book arts classroom with a 12 foot workbench, storage shelves, a guillotine, a board shear, some lying presses and nipping presses, flat file drawers, cloth racks, a tiny retail area, and a small library. We also have a tiny storage room. We are lucky to be able to share some spaces with Flatbed: bathrooms, a kitchen, and a conference room. Began offering classes Sept. 2015, nearly 200 classes have been offered. The mission of Austin Book Arts Center is to engage people of all ages in creative, interpretive, and educational experiences related to the arts of the book. Mary Baughman, Board Chair of Austin Book Arts Center. Retired from the University of Texas Ransom Center where I was a book conservator. Co-Site Host for Paper and Book Intensive, PBI, 1993 in Fischer, Texas.